The Alpine region, northern Adriatic and northern Balkans were hit by a series of severe thunderstorms over the weekend. A minor shortwave trough caused widespread initiation of slow-moving multicell clusters across the Alps from NW Italy to SE Austria and NE Slovenia on Saturday night, followed by a series of more intense severe thunderstorms yesterday, as a strong shortwave trough passed across the region. See the forecast for today for more details. Well over 700 000 lightning flashes were detected across Europe during the weekend, the majority in the severe thunderstorm outbreak area. Map: Blitzortung. Intense Mesoscale Convective Systems hit the Alpine region in the late afternoon and night hours of Saturday. Activity was mostly confined to the Alpine area, except in the east, where a MCS moved into the plains of SE Austria and NE Slovenia. Intense lightning activity was recorded with these storms, as well as locally intense hailstorms and major local flash flooding. Large hail accumulations in Fassa Valley, Dolomites, Italy yesterday evening (June 24). Report: Federico De Crescenzo. Martin Popek captured these spectacular sprites above the MCS over Austria. A particularly severe event occurred in Enego, Vicenza, northern Italy, where intense rainfall on the MCS caused massive flash flooding. Flash flooding aftermath in Enego, Vicenza, northern Italy this morning. Report: Katiuscia Guzzo via Bassa Pianura Padana Photo e Meteo. 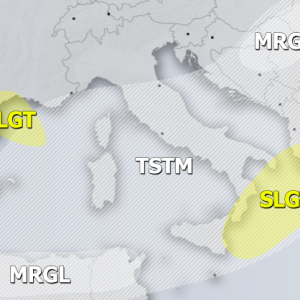 Storm coverage across the Alps actually increased during the night and by the morning, a large and very active MCS was ongoing over N-NE Italy. An intense supercell hit the area around Pordenone with very large hail. Diameters up to 8-10 cm were reported. Supercell over Fontanafredda, Pordenone (Veneto), NE Italy yesterday morning. Very large hail in Vittorio Veneto, NE Italy yesterday morning. More large hail in Veneto, NE Italy yesterday morning.